The United States of Obama are becoming a failed, divided third world nation. Colonel West refers to the Declaration of Independence as the Declaration of Vigilance. I agree. Dependence on “public servants” who seek their own independence from the law and from public scrutiny is displacing our independence. Perhaps some fine day we will regain our own independence. Jonathan Turley, whom I admire as attorney and a liberal in the old fashioned sense rather than a librul, posted an article on July third about perjury by our Government snoops. I previously wrote a column how our country seems to have developed separate rules for the ruling elite and the rest of us. There is no better example than the lack of response of the Senate to the admitted perjury of Director of National Intelligence James Clapper before Congress. While the Justice Department has prosecuted people for the smallest departure from the truth, including testimony before Congress, no one in the Senate is calling for an investigation, let alone a prosecution, of Clapper. For his part, Attorney General Eric Holder is continuing his political approach to enforcing the law and declining to even acknowledge the admitted perjury of Clapper. Now, in a truly bizarre moment, Clapper has written a letter of apology like an errant schoolboy to excuse his commission of a felony crime . . . and it appears to have been accepted. What is curious is that we do not have letters from senators like Dianne Feinstein apologizing to doing nothing when they were all aware that Clapper was lying in his public testimony. Welcome to America’s Animal Farm. . . . . For its part, the media is cooperating. Few are addressing the obvious perjury or past cases prosecuted on far less. After all, Clapper is one of the ruling elite and not the great unwashed public. The result is perjury by permission, a new exception to criminal acts for the governing elite. Please read the entire article; it is far from comforting; comforting words are not what we need today. Mr. Clapper is bad enough; the reaction of members of Congress — intended to be a separate, coequal branch of our Federal Government — is even worse because it allows, if not encourages, other miscreants to do and to say whatever they wish without fear of adverse consequences. On this 4th of July, our nation’s founders’ words ring true–that “Life, Liberty, and the Pursuit of Happiness,” are among the rights which are unalienable from all of us. In a world of NSA spying, IRS harassment, and healthcare mandates, it is ever important to remember that government derives its power from the consent of the governed. We have the power, and also the responsibility to remain ever vigilant and protective of our freedoms. 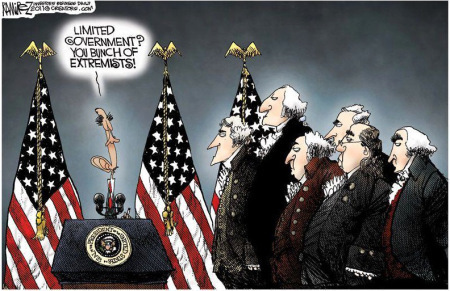 During Colonel West’s reading of the Declaration of Independence, one is tempted to substitute the words “Government under Obama” for “The King of Great Britain.” Some points would not fit were the references changed in that fashion but all too many would. The Declaration of Independence preceded our Constitution, which attempted to cast in legislative language our protections against the abuses recited in the Declaration. The Constitution was not intended to displace the Declaration; they were and remain supplementary. The need for vigilance has become overwhelming and massive snooping by Government has only one of the many factors making that need ever greater. [T]here is no longer any meaningful limit to the power of the government over our lives. No line beyond which it may not tread. That it lies, spies and tyrannizes. We can admit to ourselves the shoddy – and frightening – reality bubbling up all around us. By so doing, we can shatter the illusion that this government operates with anything remotely approximating our consent. This is absolutely essential. The 4th of July pantomime requires that we deny the obvious – that we instead pretend we’re free people living in a free country; one in which the government is accountable to the people, one in which the government is limited by law. One in which people can’t simply be dragooned into prisons without due process, held incommunicado, tortured. A country with a president who doesn’t have kill lists – or use the instruments of state power to punish and intimidate his political opponents. One in which citizens must be suspected of a crimebefore their personal correspondence is filched through and recorded for later use against them. One in which a traveler is free from arbitrary and random searches of his person and effects. One in which the attorney general of the United States isn’t able to get away with providing guns to gangs or brazenly lie about his use of the power of his office to go after political “enemies” rather than pursue justice. All these things are everyday realities. And the reality is that the America we once celebrated on the Fourth of July is gone, replaced by something dark and ominous. It is painfully obvious – so why pretend otherwise? Remember this song? What should it suggest for the United States? Will it? That’s up to us, “we the people.” Our government won’t do it for us. This entry was posted in 2014, 2016, 2016 Obama's America, Abuse of Power, Administrative Agencies, Afterburner, Allen West, Bill of Rights, Bill Whittle, Civil War, Congress, Conservatives, Constitution, Democracy, Duty, England, Executive Decree, Federal Agencies, Formerly Great Britain, Fourth of July, Freedom, Good stuff for everone free, Government and individual choices, Government reliance, Gun control, Health Control, History, Honor, Integrity, IRS, Law and Order, Liberals, Libruls, Limitation on Authority, Media, Obama, ObamaCare, Orwell 1984, Owned by Government, Political class, Regime change, States' Rights, United States and tagged Declaration of Independence, government snoops, Independence Day, life liberty and the pursuit of happiness, United States. Bookmark the permalink. 9 Responses to Happy Independence Day! Independence from What and for Whom? As long as the dems offer all kinds of entitlements it matters little what candidate the GOP offers. The country is divided almost in half. The GOP is divided as well. Put up a preferred candidate who has little chance of winning or try for the so called moderate to appeal to the independents. Not a pretty choice. Put up a preferred candidate who has little chance of winning or try for the so called moderate to appeal to the independents. Not a pretty choice. As to the independents, TeamObama seems to have become rather unpopular. Will former Secretary Clinton be the 2016 Democrat presidential candidate? Who else might it be? Otherwise I agree, but it’s a choice that we should make. The GOP powers-that-be who chose the “moderate” candidate in 2008 and again in 2012 served us ill. Unless, magically, the third time is the charm doing the same thing in 2016 will yield the same result or even worse. The question now is, of course, “who?” Dr. Carson? Maybe. Colonel West? Less likely but better than most others. Governor Palin? I like her, a lot. Unfortunately she has been made into damaged goods. I agree with you as well. We can hope things become so dismal that we will get another bite of the apple. I like your picks. Against Hillary it will be no doubt. Hyperbole about Obama & Co. aside, the reason he was re-elected was because Republicans and/or conservatives were so busy dumping on each other for real or perceived departures from orthodoxy that they couldn’t manage to come together behind a far better candidate last year. Maybe in 2016, conservatives can can do better. But I doubt it. They only hope is that the Democrats field a candidate so bad that even the Republicans can defeat him/her. There’s no need for a revolution, whatever form that might take. In fact, it won’t happen. The government still functions with the consent of a majority of the governed. If the 2012 minority is so worked up, why not show some political maturity and put in someone else, both in Congress next year and in the White House in 2016? the reason he was re-elected was because Republicans and/or conservatives were so busy dumping on each other for real or perceived departures from orthodoxy that they couldn’t manage to come together behind a far better candidate last year. There is much there with which I agree. Question, however: who do you think would have been “a far better candidate” than Governor Romney? More importantly, who do you think would be “a far better candidate” for 2016? Dan, this is a difficult July Fourth for all patriots who truly love America. The National Anthem of Scotland is beautiful and appropriate for today. Thanks for this. I posted the song on Facebook.